As people age, they are at greater risk for falling injuries. One of the main causes of falling is insufficient light in the home. Since aging eyes require a lot more light in order to see, standard lighting often isn't enough. Artificial light also tends to be glaring, which hurts aging eyes. When natural light is introduced into a living environment, the non-glare light can create a space with less light/shadow patterning that is often found with artificial light. It is this patterned light that can confuse the aging eye, often resulting in a stumble and fall. The National Safety Council contends that falling accidents are the leading cause of injury related death for people 75 years and older. When older people live in an environment filled with non-glare natural light, they not only negotiate the terrain more confidently, but they also tend to be less depressed, more social, less anxious, have a better appetite and even sleep better! All these factors add up to a much healthier and happier life, especially for people who are confined to an indoor environment. Seasonal Affective Disorder - Are You "SAD"? During the colder, darker seasons of the year, you may experience fatigue, lethargy, weight gain or even depression. You might even have other lesser, more vague symptoms like feeling cooped up or having cabin fever. Your increased anxiety, oversleeping, or loss of energy may have nothing at all to do with simply going through the winter blues. You may, in fact, have a condition known as Seasonal Affective Disorder (SAD). SAD is a seasonal type of depression, which causes serious mood alterations in some people during lighting and temperature fluctuations caused by the four seasons. Most people experience symptoms of SAD beginning in the late fall to early winter. Symptoms of SAD can even last until late summer! Every year, half a million people in the United States suffer from this common type of fall- and winter-induced depression. Experts are not exactly sure what causes Seasonal Affective Disorder. However, it is believed that the mood shifts in those who experience SAD are related to changes in the amount of daylight to which a person is exposed during different times of the year. The lack of light may upset a person’s sleep-wake cycle, or what is known as circadian rhythms. Lack of natural light may also cause a person’s mood to shift off-kilter due to non-sufficient amounts of serotonin in the brain. How can Solatube Daylighting Systems cure SAD? By providing more continuous, evenly dispersed sunlight to even your darkest rooms, Solatube Daylighting Systems add clear, pure natural light to your home, creating a natural increase in mood year round. Several studies have shown that increasing daily exposure to natural light can enhance mental and physical well-being, boost concentration and energy levels, and provide a number of other benefits. Now you can have the best solid defense against the effects of Seasonal Affective Disorder. Light is becoming a very important design element for homes and office buildings. Studies have shown that when people live and work in a well-lit environment, they are happier, healthier and more productive. According to some power company studies, nearly one quarter of annual electrical use in the United States is attributed to lighting. The good news is when Solatube Daylighting Systems are integrated into the design of homes and businesses, the natural light brought in through these highly reflective tubes is often the only light source required during daylight hours. The Solatube not only brings in the benefits of natural light (improved moods, increased energy levels, reduced eyestrain, etc.) into the home or workplace, but it costs absolutely nothing to operate during daylight hours. Now that is a true energy savings! Do you have a house that has been sitting on the market just a little too long? 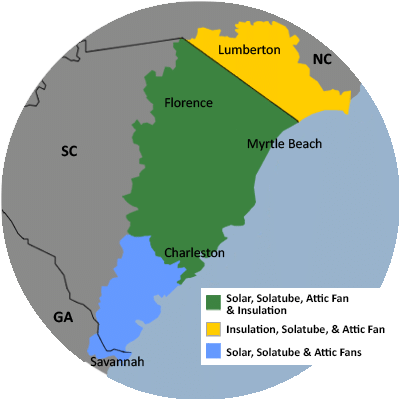 If your home is too dark and dreary, you can easily transform your home with the simple addition of one or two strategically placed Solatubes. Since light is becoming a real design element in home decorating, give your buyers what they want—natural light!